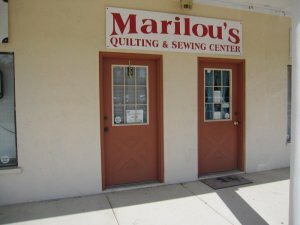 Marilou's Quilting and Sewing Center has been serving the Sebastian, FL, community for over 16 years, offering a large selection of fabrics, notions and supplies to meet the creative needs of sewing and quilting enthusiasts. Originally established in 1996, we purchased an innovative Gammill Longarm Quilting System and started teaching quilting classes. In 1997, we broadened our scope to include the exclusive sales and service of Husqvarna Viking sewing machines, along with new owner classes and qualified maintenance and repair of all sewing machine makes and models. Marilou's passion for sewing (developed at a very young age) is evident in every service we offer, from the shop's carefully selected inventory, to the friendly, personalized attention each customer receives. Throughout the years, she has closely watched industry changes and trends, educating staff members on the latest sewing and quilting news, and product releases, so we can better serve our patrons. After 22 years of teaching in the public school system, with few opportunities for sewing, Marilou is now thrilled to teach others her favorite hobby and share her knowledge and expertise with everyone who walks through her doors. Marilou and her daughter, Melissa, are always on hand to assist customers with projects and make sure their visit is a memorable experience!